Writing in the Moscow Times Gyorgy Schopflin, formerly Jean Monnet professor of politics at University College London and currently a member of the European Parliament for Hungary, says that Russia has “no place in Europe” because it is too uncivilized and barbaric. The events of the last few weeks have made it clearer than ever that Russia has no place in Europe. The invasion of Georgia, the disproportionate use of force, the presence of irregular forces, the looting and deliberate destruction of infrastructure and then the recognition of Abkhazia and South Ossetia as “independent” are all evidence of a Russia that is not European and does not want to be European. Of course, what it means to be European has varied over time, but Russia has expressly flouted European values as they are understood by most Europeans. Russian spokesmen may insist that they are part of the common European home, but the way in which they want to furnish it is unacceptable to its other inhabitants. Despite Russia’s overwhelming advantage in size and firepower in its conflict with Georgia, the Kremlin may have the most to lose if the fighting there continues. It is too soon to know with certainty who was responsible for the initial outbreak of violence in South Ossetia, but the war that began there is no longer about Georgia’s breakaway regions or Russian peacekeepers. By acting disproportionately with a full scale attack on Georgia and seeking the ouster of Georgia’s democratically elected President Mikheil Saakashvili, Moscow is jeopardising its standing in Europe and the broader international community – and risking very real practical and political consequences. The Weekly Standard continues its excellent analysis of the new cold war battlefield. First it dealt with tactical issues, and now it turns to strategic matters. My brief assessment of the military options open to the West in the ongoing Georgian conflict “The Pain Game: A Military response to Russia’s aggression?” provoked many comments both favorable and unfavorable. The most thoughtful criticism accused me of elevating the tactical over the strategic; i.e., of not looking at the “big picture.” To that I offer a qualified “Mea culpa.” The piece was intended as a focused response to numerous commentators, decision makers, and analysts who said the West had no “military options” in Georgia, when in fact there are such options. The world’s major industrial countries are calling for increased economic support for war-torn Georgia. Even by Russian standards, the level of irrationality in the Kremlin’s behavior over the past two weeks has been breathtaking. And trust us, that’s saying something. Russia attacked Georgia without, it appears, reflecting for even a second upon the facts that (a) it would look like a fool after condemning U.S. action in Iraq and crushing the separatists in Chechnya or (b) it would polarize the nations of Eastern Europe to a hysterical extent just at the very moment when it was seeking to get them to reject the proposed U.S. missile defense system, driving them into the waiting arms of NATO or (c) it would provoke the world’s most powerful country and its NATO allies into a new cold war, just like the one that absolutely destroyed the USSR or (d) it could even be helping Putin’s arch nemesis, John McCain, come to power. And then, believe it or not, it got worse. Two brilliant op-eds from a trio of lawyers writing in the Wall Street Journal show that it, along with the Washington Post, is clearly on the cutting edge of leadership in the new Cold War. Russia’s invasion of Georgia will be a defining moment for America’s credibility and global stability. 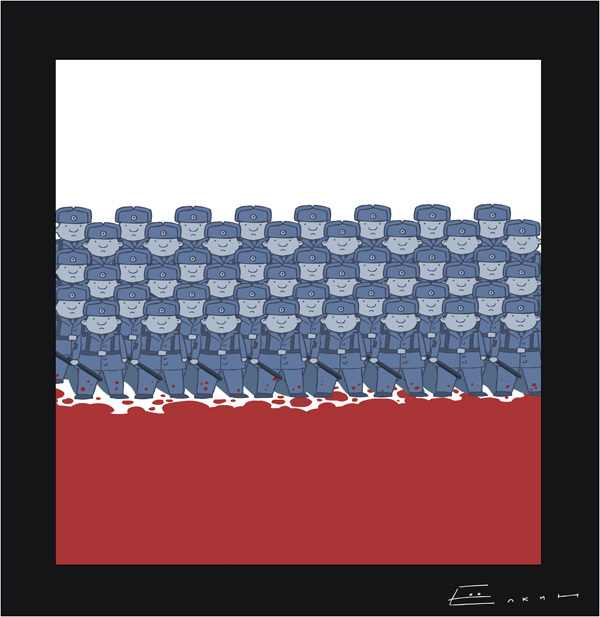 If the Medvedev (or, rather, Putin) regime succeeds in using force to topple a democratic and pro-Western government, based on spurious claims of “protecting” Georgia’s population against its own government, the stage will be set for similar aggression against the other states — from the Baltics to Ukraine — that border Russia but look to the free West. The dangers of the post-September 11 World will be combined with the challenge of a new Cold War.